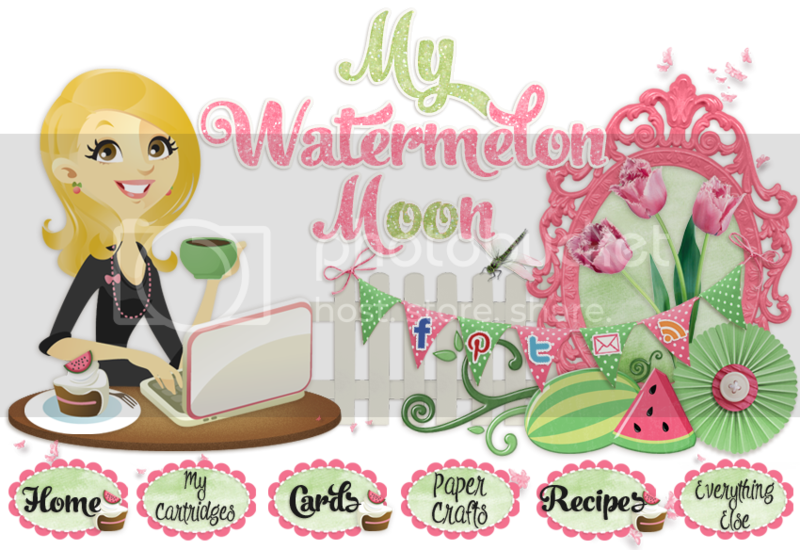 My Watermelon Moon: Exciting Announcement & A Winner!!! Hello! I've been quiet the last few days... feeling quite under the weather. So I took it easy. It's also been REALLY hot here, record breakers, and totally not fun at all. Hope we get a break soon! First, I would like to announce today's First 50 Giveaway winner! Vonnie, Email me your addy and I will get your prize out to you! Hooray! Thanks to everyone who joined in my first giveaway! I already started planning my 100 follower giveaway, Looks like it will be soon! My announcement is that I am going to be on my FIRST Design Team! 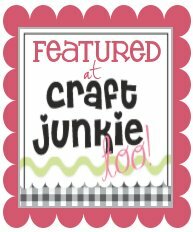 I will be on the design team for Hiding in my Craft Room! I am excited to work with Laurie and the rest of the team, and help out with her weekly challenges. This is a great way to challenge myself and work with a team. Hooray! This fun begins in October. Hooray! I learned a lot about how to use vinyl and transfer tape for this project... I am feeling like it might not be done though. 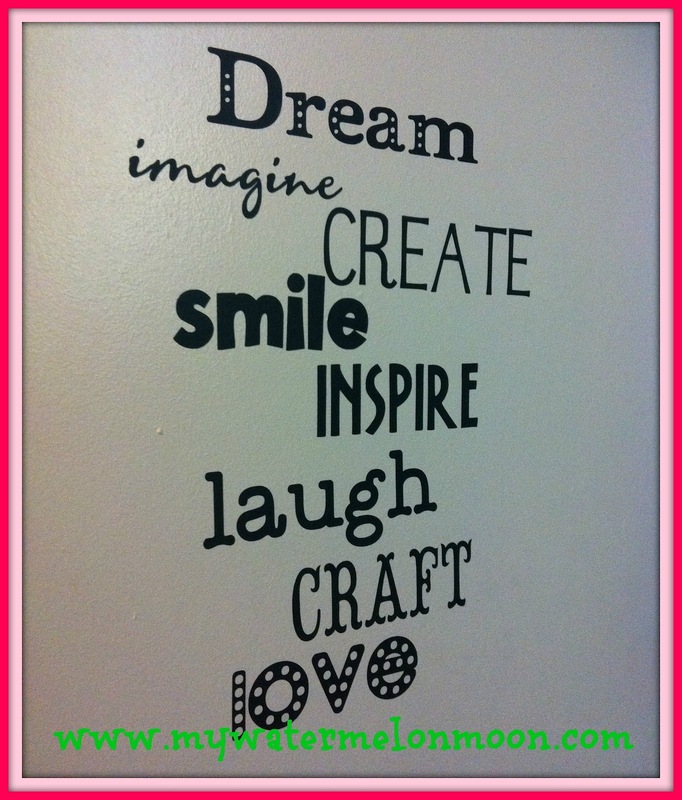 I am thinking of adding a frame perhaps, and maybe some more inspirational words... What do you think it needs? Thank you Stephanie! :)and thanks for stopping by! Hi - thanks for stopping by and for the follow - I'm now following you back - you have the cutest blog! It is adorable!!! congrats to the winner! you are so creative!! PS. I'm having a mom's link up as well and would LOVE to have you! I'm stopping by from the marvelous Monday party (I get to co host this week so be sure to stop by my blog and say "hi" if you haven't done so yet!) 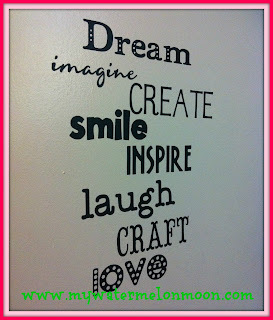 Your blog design is adorable!!!! Absolutely love it. I need to get a vinyl cover. I think it looks cute just the way it is. I like the different fonts too. I'd love it if you'd visit my blog. I came and visited! New follower here! :) Have a great week! Thanks for stopping by my blog and leaving me such a nice comment. I love your blog! I looks so cute and fun. I just want to stay here and look at all the neat stuff. I'm now a follower. I love it the way it is but my first thought was a frame or offset corner decorations. 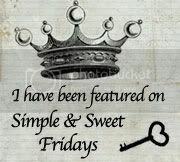 Thanks so much for linking up on I Freakin did it Friday @ Miss Information, I hope to see you back this week! I agree Kelley, I think it need something! I just wanted to say that I love the design of your blog it is so warm and inviting. It was a nice site when I clicked on your link in the Monday Mingle.